An award to be given to outstanding 4-H’ers in Harrison County in memory of Robert Wigginton, Extension Agent in Harrison County from 1942-1964 is in its 21st year. It is based strictly on 4-H activities. The award will be made to one outstanding senior 4-H’er and one outstanding junior 4-H’er each year. A 4-H member may only receive this award once as a junior 4-H’er (ages 9-13) and once as a senior 4-H’er (ages 14-19). Age is determined by the 4-H’ers age on Jan. 1 of the award year. Joshua Isaiah McLeod was born to Roberta and John McLeod on Feb. 8, 2009 at Harrison Memorial Hospital. He weighed 7 lbs., 9 oz. Maternal grandparents are Kenneth and Juanita Slone of Harrison County. 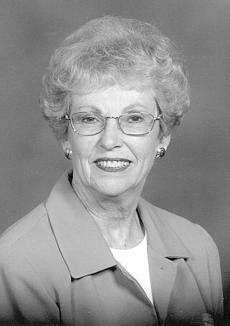 Paternal grandmother is Gillian Dianna McLeod of Harrison County. Births announced this week are: Cody Grant Baker, Feb. 16, son of Tracey and Wendy Baker; Rylee Alexandra Hall, Jan. 9, daughter of Nathan and Cathy Hall; Madison Bailey Ketchersid, Feb. 26, daughter of Paul and Tammy Ketchersid; Sabrina Nicole Rice, March 1, daughter of Floyd and Veronica Rice; Daisy Mariah Robinson, Feb. 11, daughter of Chris and Judy (King) Robinson. Earl G. Robbins II, M.D., new gastroenterologist to join HMH Clinic. He is a specialist in the fields of gastroenterology and hepatology, diseases of the digestive tract and liver. Visiting Angels, one of the nation’s fastest growing providers of assisted living services for seniors, has opened its newest franchise serving Scott County, in Georgetown. The new location, owned and operated by Ben New, a native of Georgetown, provides non-medical senior homecare to help elderly and older adults to continue to live in their homes. The new Visiting Angels location is located at 137 E. Main St. in Georgetown and will provide services for seniors in locations throughout Central and Eastern Kentucky, including Cynthiana. 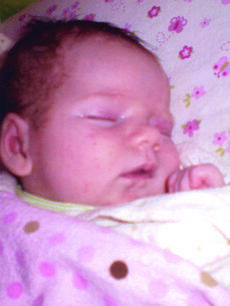 MaKenzie Lynne Burden was born to Jeremy and Stephanie Burden of Cynthiana on Jan. 22, 2009 at Georgetown Community Hospital. She weighed 7 lbs. 3 oz. Maternal grandparents are Larry and Judy Pierce of Cynthiana; maternal great-grandparents are J.L. and Louise Richardson, and the late Willie Pierce and Marshall and Dorothy Tucker. Paternal grandparents are Kenny and Connie Burden of Cynthiana; paternal great-grandparents are the late Wayne and Ruth Spegal and Kenneth and Barbara Burden and Shirley Wagner. * Log Cabin, Nov. 11, 1905 - “The Wiglesworth Bros., Co., Poindexter, Ky., Established 1856, Incorporated 1892 - This firm distills the famous ‘Old John Poindexter’ and ‘G. W. Taylor’ Bourbon and Rye whiskies. This distillery is one of the oldest in the state of Kentucky, and has been producing pure whiskey for the past 50 years at its present location. It has been run successfully since it was established in 1856, and has always made only pure old fashioned Bourbon and Rye whiskey. Jason Louis Rage McKenney was born to Jason and Angela McKenney of Cynthiana on Jan. 30, 2009 at Harrison Memorial Hospital. He weighed 5 lbs. 9 oz., and is welcomed by his brother, Tre Jackson, and sisters, Mariah Richardson and Victoryia McKenney. Maternal grandparents are Fred and Linda Riley and Mark Richardson, all of Berry, Ky.; maternal great-grandparents are Robert Louis Beuge and Margret Beuge of Chicago, Ill.
Joyce Clifford was recently inducted into the Kentucky 4-H Centennial Hall of Fame in Lexington, Ky. 4-H is celebrating 100 years, founded in 1909. To commemorate this special event, one volunteer leader was selected from each of the 120 counties in Kentucky. These leaders were chosen for their years of service and dedication to the 4-H program. Clifford received a certificate and her name will be placed on a large tree-shaped wooden plaque along with the other 120 inductees. 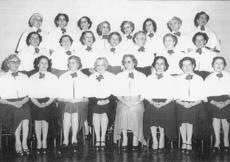 This plaque will be hung permanently at the KY Leadership Center in Jabez, Ky.
Pictured above are the members of the Harrison County Homemakers Chorus around 1952. Row 1: from left to right, Mrs. Frank Ross, Mrs. Holton Smith, Mrs. Clifton Shimfessel, Mrs. Odus Kitchen, Mrs. Rice Fryman, Mrs. John T. Dawson, Director Mrs. William McKenney and Mrs. W.H. Berry. Row 2: from left to right, Mrs. Phillip Harrison, Mrs. Wallace Mastin, Miss Elizabeth Donnell, Mrs. Jack Judy, Mrs. Ira Monson, Mrs. J. Leslie Judy and Mrs. Stanley Lemons Sr. Row 3: left to right, Mrs. Smiser McCauley, Mrs. Maxie Moss, Mrs. Leonard Toadvine, Mrs. Stanley Pepper, Mrs. W.L. The Harrison County 4-H Saddle N Spurs Club is having a fundraiser that will benefit the horse community. A Horse Health Day has been scheduled for March 28 beginning at 7:30 a.m. at the Harrison County 4-H Fairgrounds. The 4-H Saddle N. Spurs club will be hosting the event which is equivalent to the health days held in Pendleton County by their local 4-H club. Hosting the health day in Harrison County will reduce travel and provide preater assistance to the Harrison County residents. * Cynthiana Democrat, 1896 - “The latest improved machinery is in use at the pumping station; the standpipe is of immense capacity. The city waterworks, aided by a well organized and thoroughly disciplined fire department, afford almost invincible protection against fire. The streets are brilliantly illuminated with electric lights - arc lights principally - and the majority of the residences are likewise lighted. A complete telephone system is in operation. Two telegraph companies, the Western Union and Postal, furnish every facility in their line. Two weeks ago I asked “what more Mother Nature?” Well, another gusty wind storm was served up adding to the collection of debris left by the ice storm. Some serious questions are coming in about what to take out and what to try and save. I am not a certified arborist, but I can pass on the guidelines that certified arborists are taught when it comes to tree assessment and risk management. These criteria may help you decide what to do now and in the future. 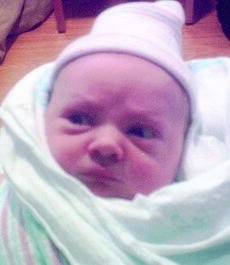 Brock E. Clark Jr. was born to Megan Scott of Cynthiana and the late Brock Clark on Oct. 9, 2008 at Harrison Memorial Hospital. He weighed 6 lbs. 14 oz. Maternal grandparents are Doug and Tammy Scott of Cynthiana. Paternal grandparents are Dwayne Clark and Valinda Thomas of Paris. Kentucky has been through it recently. From the shock and destruction of the recent ice and snowstorms to the out-of-season, spring-like storms that brought damaging winds to already vulnerable landscape trees, residents are reeling trying to figure out where to start the cleanup process. 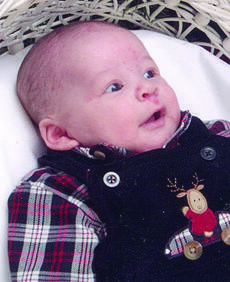 Kade Wyatt Michael Baucom was born to Toni Baucom of Cynthiana and the late Chad Baucom, on Dec. 4, 2008 at Harrison Memorial Hospital. He weighed 8 lbs. 6 oz. Maternal grandparents are Eva Fischbach of Cynthiana and Roy Thompson of Owensboro, Ky.; maternal great-grandparents are Hiram and Marie Bailey. Paternal grandmother is Judy Rounkles of Portola, Calif.; paternal great-grandparents are Eve and Hobart Rounkles. 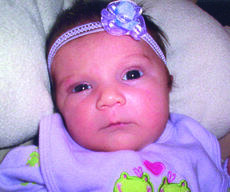 Madalynn Kanance Martin was born to Nitosha Pickett and Travis Martin of Cynthiana on Dec. 11, 2008 at Central Baptist Hospital. She weighed 9 lbs. 4.2 oz. Maternal grandparents are Pamela Baxter and Darrell Baxter of Cynthiana, and Kevin Pickett of Sadieville, Ky.; maternal great-grandparents are Marcella Scudder and Paul Jones of Corinth, Ky., Mary Jo Pickett of Lexington, Ky., and Gordon Pickett of Corinth; great-great-grandmother is Ruth Rumo of Lima, Ohio. The 64th anniversary of Iwo Jima will be held at the VFW Post in Flemingsburg, Ky. on Sunday, Feb. 22 at 3 p.m. Ceremonies honoring PFC Franklin R. Sousley, USMCR (KIA) will be held at the Elizaville Cemetery, Elizaville, Ky. at 4 p.m. The public is invited to attend. For more information contact Marine Corps League, Dan Daly Det., Lexington, Ky., 859-277-2654 or the VFW Post in Flemingsburg at 606-849-2257. Births announced this week are: Emily-Jo Madison Collett, Nov. 26, daughter of Amy DeShea Rankin; Abby Lynn Cooper, Feb. 6, daughter of Allen and Kendra Cooper; Kyle Lucas Hill, Feb. 8, son of James Alex and Mary Beth Hill; Gabriel Benjamin Perkins, Feb. 5, son of Bennie and Miranda (Mandy) Perkins; Jessie Dean Sharp, Feb. 9, son of Kenneth and Dianna Sharp; Hunter Michael Wiglesworth, Feb. 8, son of Ginger and Chris Wiglesworth. * Cynthiana Democrat, July 26, 1917 - “Today is Patriotic Day for the Knights of Pythias and will be celebrated in some form by every lodge of that order in the country. At Cynthiana there will be music, a parade, and an address by the Hon. Kimball of Lexington. The parade will start promptly at 1:30 o’clock from in front of the court house and will pass through the principal streets down town. The speaking will be in front of the court house at 2:30 o’clock.